The mounting death toll and devastation in Vanuatu since Cyclone Pam smashed the Pacific island nation this weekend have heightened calls for a global climate change compensation fund. From the Maldives to the Marshall Islands, small island leaders said yesterday that the losses in Vanuatu -- with 24 confirmed dead and more than 3,300 people displaced, according to the United Nations -- hit home for them, as well. They and others insist that providing a way to address the unavoidable economic losses suffered due to climate change, known in the lingo of international negotiations as "loss and damage," must be a central part of any new climate accord. With governments preparing to craft a deal in Paris in December, they said, Cyclone Pam gives a tragic potency to their argument. "This is a wake-up call. How many more Vanuatus do we need?" said Ronald Jean Jumeau, the Seychelles' roving ambassador for climate change and small island developing state issues. Recalling the many U.N. climate change meetings that happened to coincide with killer storms but ended with few tangible gains for vulnerable nations, Jumeau said, "It would be a shame on humanity if we didn't learn enough from what's happening in Vanuatu." Ahmed Sareer, the Maldives' ambassador to the United Nations, said in a statement to ClimateWire: "The Cyclone Pam tragedy graphically illustrates that while we are facing 21st Century storms, stronger and more destructive than ever before due to climate change, our infrastructure and disaster response systems are stuck in the 20th and some cases 19th Century. "We urgently need to modernize our preparedness and part of that means looking at how Loss and Damage plays a role in addressing climate impacts," he said. The Category 5 tropical cyclone brought with it winds of more than 150 mph and storm surges as high as 26 feet. 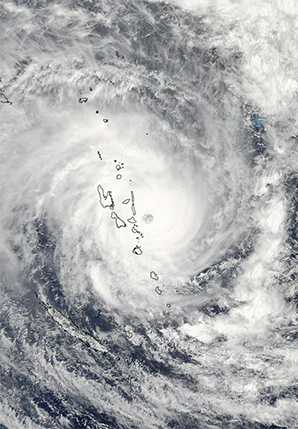 The most destructive storm to hit landfall since Typhoon Haiyan hit the Philippines in 2013, Cyclone Pam caused damage on other islands, like Kiribati and the Solomon Islands, before it essentially flattened Vanuatu's capital city of Port Vila. A little boy named Samuel found his soccer ball in the ruins of his family home in Port Vila, Vanuatu, after Cyclone Pam destroyed 90 percent of the city's buildings. Photo by Dave Hunt, courtesy of AP Images. By yesterday, rescue crews and relief workers were reporting the destruction of more than 90 percent of buildings in Port Vila, felled power lines and a desperate need for freshwater supplies. The president of Vanuatu, Baldwin Lonsdale, who happened to be attending a U.N. conference on disaster risk in Sendai, Japan, when Cyclone Pam struck his archipelago nation, explicitly linked the destruction to climate change and said a "monster" had struck his country. "I am very emotional. Everyone has that same feeling. We don't know what happened to our families. We cannot reach our families; we do not know if our families are safe. As the leader of the nation, my heart hurts for the people of the whole nation," Lonsdale said. "The cyclone seasons, the warm, the rain, all this is affected. This year, we have more [rain] than in any year, and for the last couple of weeks, the heavy rainfalls throughout Vanuatu ... exceeded what has happened in the past," he said. "Yes, climate change is contributing to this." Lonsdale made a plea for international humanitarian aid, which is beginning to pour in, with reported pledges of 5 million Australian dollars ($3.83 million) from Australia; 2.5 million New Zealand dollars ($1.84 million) from New Zealand; and about £2 million ($2.95 million) from the United Kingdom, as well as a World Bank announcement that it is exploring quick insurance payouts to the government. The United States pledged $100,000 and sent relief workers. 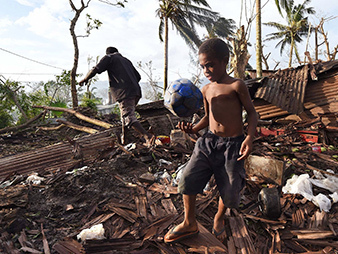 Yet those pressing for a loss-and-damage mechanism in a new global agreement said that if one existed, Vanuatu and other deeply vulnerable countries might have some protection before disasters occur. "Countries wouldn't have to go around with a begging bowl, which is what is happening in Vanuatu right now," said Saleemul Huq, director of the International Centre for Climate Change and Development in Bangladesh. Huq has long advocated for the United Nations to better consider what it means for countries to suffer the complete loss of human lives, infrastructure and species from the impacts of climate change. Yesterday, he said leaders of vulnerable nations are more determined than ever that this "loss and damage" be recognized separately from efforts to help nations adapt. "Cyclone Pam highlights the fact that loss and damage is real and has to be dealt with and cannot be brushed under the table any longer," he said. "The reality on the ground is showing us that it's not about the future; it's about the now." Currently, the text being prepared for Paris includes two options: mentioning loss and damage or deleting all reference to it. Wealthy countries, which fear bringing loss and damage into the Paris agreement could expose them to liability for the costs of climate change, have largely opposed its inclusion. Large developing nations, meanwhile, say they are in favor of protecting small, vulnerable countries but have been willing to use loss and damage as a trade-off. Ambassador Jumeau of the Seychelles explained that until now, island leaders had not expected many gains on loss and damage from Paris. A U.N. meeting two years ago created a mechanism for addressing it that essentially kicked all major decisions to 2016 -- conveniently after Paris. The islands of Vanuatu are superimposed on a satellite photo of Cyclone Pam, which is being called a "monster storm." Pam's eye can be seen just east of the islands, wrapped in a thick blanket of violent thunderstorms. Photo courtesy of NASA. But Jumeau argued that even with many scientific unknowns -- chief among them just how much climate change is influencing current storms like Cyclone Pam -- he believes there are an increasing number of reasonable assumptions to make about the current climate-related suffering and needs of vulnerable nations. "If we accept that climate change is warming the oceans and damaging reefs, well, reefs are our first defense against ocean tides. Even if the storm itself is not [caused by] climate change, through collapsing reefs our islands have been made more susceptible. Then you look at the scale of what's happened to Vanuatu," he said. "We have to take loss and damage seriously. A storm like this is going to set back the economy of Vanuatu for who knows how long. It is much more difficult proportionally for an island this small," he said. And while 24 deaths may seem like just a handful for larger nations, for an island, that number can be devastating. "Not long ago, in Seychelles, there was a bus accident and three kids died. The whole country was in mourning. Everybody on the island either knew the kids or knew the parents. It hits home," Jumeau said. In Vanuatu, he said, "This is not just buildings falling down. It's lives torn apart. It's a whole fabric of society that has fallen." Deborah Barker-Manase, deputy permanent representative of the Marshall Islands to the United Nations, told ClimateWire by email that while it may be difficult to assess just how much of any storm is caused by climate change, warming temperatures are clearly making already vulnerable islands more vulnerable. "We don't have time for fingerpointing, or handing out blame," Barker-Manase said. "What is critical is that Paris negotiations send a powerful and transformative signal on positive global action -- and also provide all of us with some basic tools to better address future linkages between climate change and security. "Everyone needs a real kick in the pants on jump-starting adaptation. That is a priority. But the scale of devastation in Vanuatu now, let alone future risks, makes clear we have to engage with -- and understand -- the full range of future risks," she said. "It is very hard to put a dollar sign on what is really at stake, so simplistic or reactionary answers won't work. We need clear hooks to address security risks going forward, but most importantly, the most vulnerable and the whole world needs a platform for strong action starting now and increasing over time." What will happen in Paris on loss and damage remains unclear. Countries are not likely to see extra aid there, but Huq predicted there will be a renewed push for a clear mention of it within the new agreement. And, he said, the experience of Cyclone Pam "will certainly lend weight to the developing countries" in their fight. "This is what they predicted, this is what they said would happen, and it's happening now," Huq said. "This will certainly bolster their stand."